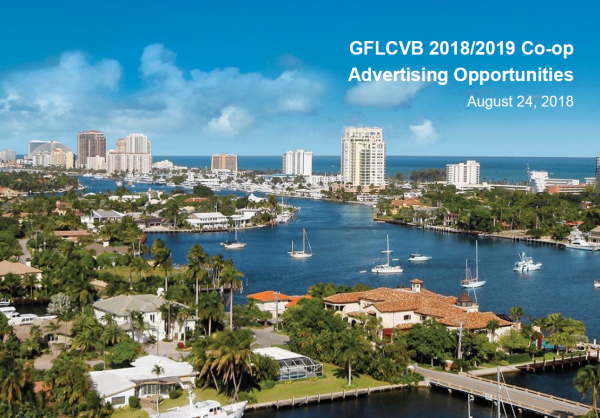 The Greater Fort Lauderdale Convention & Visitors Bureau co-op program continues to grow as we offer multi-dimensional benefits to our hospitality industry. Maximize your advertising dollars by spending less for more exposure. This advertising menu offers a multitude of programs representing the diverse interests of the industry. The 2018-2019 co-op program will enrich the opportunities and increase value for our hospitality industry by offering multiple bundled packages based on audience segments, cost, and trackable digital results. The co-op programs, by design, are flexible in timing, structure, costs and markets impacted. The co-operative advertising program has proven to be a vital tool for the hotel industry to promote their businesses and take full advantage of all available cost saving opportunities. The implementation of all co-op advertising programs is contingent on securing industry participation. See individual co-op programs for contacts and specific deadlines. Co-op participation is on a first come, first serve basis.